Heal And Prevent Disease! Cannabis Juice, Homemade Tinctures, Seedlings, Leaf, Kief, Raw Flowers - Dietary & Non-Psychoactive! Clinical researchers Kristen & William, and laboratory researcher Yosef Sarne reveal the ultra-low dose of THC in Green Leaf Therapy. As many as 50 patients had remission with Green Leaf Therapy, conception thru 2015. In this time, 150 conditions had a successful clinical phytocannabinoid treatment with leaf. "Patients facing end stage cancer, eat the bud raw. That puts in 100% and, doesn't waste any cannabis on equipments." 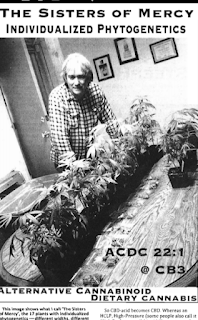 Both the clinic of William Courtney and Epsilon Apothecary continue as cannabis clinicians. Eat your most healthy vegetable! Dr. William Courtney and his wife Kristen show us some ways to eat raw cannabis in a tasty way. The optimum way to receive the healing and non-psycho active cannabis is to eat a few raw leaves every day. Just as the animals in the wild do to maintain health. I hope to present readers here with ideas such as CBG as immune modulator, Yosef Sarne (finally!) proving THC has amazing activity at the ng - mcg scale! Our easiest, most immediate access to raw cannabis comes as dry flowers; or similiarly good but less effective as a therapy, a physiologic THC dose in a teaspoon hempseed oil. Even bud tea, using hot water a minute after the kettle gets taken from boil, would have acidic compounds remaining (So, if you want raw hemp - flower pellets come cheaper than juice). I like kief seasoned rice, hempseed oil, and maple syrup; as well in honeywine. Because raw phyto-CB rarely interact with medications, those Roman-era herb wines with any fresh-stored flower became safer than vino alone! Good way to find hemp medicament, #rawcannabis search on IG. Highlight "PER" to skip thru into important info. Highlight "ANIMAL" to learn of our ken relationship! Find 10 recommendations for organic, affordable vendors, of both hemp and hybrid, half thru pg; or scroll three Youtube frames down and pass hempgrass sprouting. Most regions in the Eastern world have roots with this herb: From Korea, who may have introduced Traditional Medicine to Cannabis; to Africa, with the ancient Unani medicine system. This camp follower, hemp, has ken to us over huge periods of civilization; researching clinicians know the loss of CBD in "medical business" strains only hints at the overall loss in activity in the time since we've given it a Latin name. Mammals, reptiles, and various animal families find occasional moments snacking at this vegetable sustains a thriving health.
. . . Bookmark their forum! More specific, home-made raw or partially active medicine becomes important to parents and patients; this apothecary does R&D to ensure effective rx. This pdf guide has steps for making an essential oil with dry flowers. Essential fats, as bioactive delivery system, as hormones and immune modulators, formed the pearly tone and complexion of 'Inuit' folk, 'Korean' folk - happy fishing bonus. The same vigor thrives in a small Chinese community; pronounced Ba-ma. Three types of hemp - three uses. These rooted, aged family farms consume more hemp butter than kimchi ladies enjoy tangy bok choy. Hempseed oil, being so full of terpenes and acids, gives pleasant tonic activities for daily meals; make sure to have other oils and terpenes in food also! 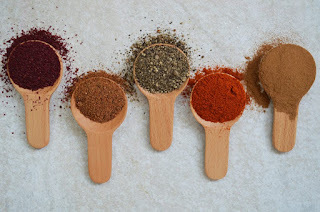 I mill 12 oily spices: flax, chia, basil seed (tukmaria/sabza), allspice, long pepper (pippali, piper longum; piperine helps with food digestion), brown/dijon mustard (important compounds for balanced estrogen), black sesame, black cumin, cumin, coriander, fennel and poppy. Other alternatives like medical ozone, shungite water, beetroot - a solid health builds using oxygenating remedies. Generally nutritive herbs, preparations with nettle and asparagus root. Immune modulation with high potency raw cannabis will not interact with most pharmaceuticals; safe for a toddler stressed with colic - and the parents in a high stress job. I treated myself taking raw oil in glycerin; "nonameoil"
6:3:1 ratio 64% THCacid 26% CBGacid 10% CBDa; definitely a beautiful Colorado hemp hybrid. If you teach stuff from this page, remember nonameoil ships world wide! 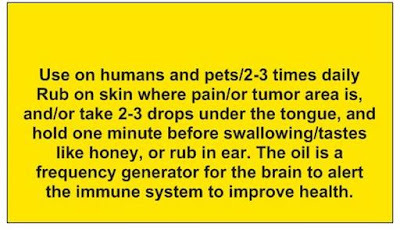 From @cbdoil4u, it has "woken up" patients in coma of a month. Personally, I would start with CBGacid for many conditions. Immune health, neural health, a treatment for endometriosis - much of the same attributed to CBD. Any studies where CBG made an unknown presence would have miscredited cannabidiol. Many who would choose to grow have an idea of pain relief available by fresh veggie salad; some take the greens off half into flowering weeks for CBGa peak, some enjoy hempgrass sprouts before breakfast. An interesting anecdote, one lab found a notable presence of CB in the weight of leaf compared to calyx. Greens on a lightly seeded mother definitely taste particularly spicy. Your preferred application may only compare to 0.01% of the medicinal activity of the vegetable - although many conditions (like Chron's) ask for both neutral and raw. Dr. Ruth Ross observed THCa & CBDa have twice the bio-activity compared with each neutral molecule, THC and CBD, at a 10 mg dose. The subsequent patent on acidic CB explains a multitude of dietary applications of 'Medicinal Acidic Cannabinoids'; evidence of the acids anti-inflammatory effects at COX 1 and 2, TNF(a) and Interleukin 10. Kief alone (mg THCa & ng THC) can topically wake up our immune system where neoplastic tissue proliferates - cases of 1-3 weeks for skin cancer remission. In leaf, the plant presents these compounds at amounts reflecting our physiologic need; more medicinal while vegetative. The clinic thoughtfully created videos and held another interview before they moved to Dominica (dominica.dm); continue appreciation for the plant with recent research connecting dietary and clinical. Dr. Bill's patients find an improved quality of life - recalling lucid dreams, protecting each of the major organs, and less stress with the increase in serotonin. "The totality of life is in the hands of raw cannabis." "Cannabis is not a cure for death. It is a celebration of life and health." "Disease arises at the cellular level; cannabis supports cell health - if you are willing to use it in a respectful fashion." "This plant: we can't even imagine what thirty million years of collateral evolution means. But it is a pinnacle of enormous, enormous amount of effort. And the last thing it needs is for humans to come along and completely invert the chemistry and the ratios." "As opposed to our previous interest in taking a single molecule out of 150, and consuming 30, 40, 50,000 micro-grams of that when the animal kingdom is doing twenty or thirty." The vegetable has the term 'fabulous food' sprout through seed. Chewing the plant promotes oral health; and has no loss of valuable cannabinoids, as would occur with blenders and juicers. The liquid retained on the walls of a blender carry a great percentage of the trichomes from plant material. Green Leaf has good zinc, silica; balanced phosphorus, calcium and magnesium. An important vegetable: cooked hemp greens (and even re-heated!) digest without a psycho-active, euphoric state - something that could effectively limit dietary intake. Feral hemp and landrace hemp may have a very vital spectrum, compared to cultivated Cannabis. A cultivated hemp variety may test for 0.03mg CBDa in one young leaf; higher in a Colorado variety 'Otto'. Wild animals consume a few leaves as a rule, without needing too much for health (Some strains being *very* attractive to the herd!). Interesting, right! Contact clinic if you would like to participate in the research, by supplying wild beings of all sort your variety of strains, under scope of a 50 dollar game camera. A small browsing session of three to five vegetative leaves delivers 20 - 50 nanograms of Delta-9 THC - with a spectrum of healing compounds. Biphasic activities of Cannabis: 100 nanograms THC (a 'Yosef Sarne' dose) - both highly prophylactic and easy to consume; a partially active low-dose tincture can treat and control some sensitive conditions of the brain, also prophylactic; a high-dose of acidic or neutral cannabinoids may not only have less benefit (GW Pharm), but can send a patient backsliding into a condition (CBD companies generally do NOT care about children). Behavioural Brain Research and Experimental Brain Research published Prof. Sarne's research; which, being in the area had a donation of THC from Mechoulam's lab. Not long after, another Israel research team produced a metered inhaler device a 'SYQE' - the first clinical ultra-low dose without raw cannabis or a hemp. The lowest setting administers 100 microgram THC. One can use a 'triple' arc lighter as a vaporizer heat source. Directly, these work well on concentrates; high CBD; arc smoking causes less tar and waste in a crystal clear glass pipe. Since we know THC acid does break down into Delta-9 quite slowly, dry buds become most medicinal ground as organic kief; likely still in the nanogram THC range while stored properly. Raw cannabis enzymes and chlorophyll do better digesting, especially with hempseed oil - but kief on yogurt works for most of us. Vegetative leaves have more medicinal activity than flower stage foliage; and vegetating leaves have much less fiber to chew than a mature cola. Mature leaves have a strong dose of enzymes. These big leaves have often found the title of 'juicers'; in such wise, let the plant grow out her large fans before harvest. CBD, info on when to harvest & lamp distance for trichome development, you could likely get in the clinic forum. 34 million years of co-evolution, mankind originally had eaten raw cannabis along with every other land-faring invertebrate. Rabbits and some cud-chewing cattle learn to limit intake - the secondary stomach in the GI tract may cause any THCa to become psychoactive THC. "As we look at how other animals use and benefit from this living plant across the year, there is a lot to learn about our own health maintenance ability to prevent disease. . . And the ability to deal with trauma, surgery, incisions, healing and repair; as well as recovery from conditions we may have found ourselves in." Considering years of Green Leaf Therapy, this clinic insists cannabis has an essential place in our diet: During pregnancy, and for any individual between conception through senescence. Patients of age 30 or senior, and those with compromised immune systems may need Green Leaf Therapy as a therapeutic essential. In a course of three months, using the plant as a vegetable, you may find optimal health; tissues saturated with a homeostatin. The seed achene & oil provide GLA; which our body turns to CLA, for use as cholesterol, hormones and endo-cannabinoids..! "Anuvasana Basti" w/ HSO if you find yourself in a gastric/hormonal distur-bulance. Combining fats and leaf or juice improves digestion; best oil being hempseed oil. Swiss hemp essential oil has tested 540 mg of CBD and 3 mg each CBD, CBG and CBN per kg. A trace amount of THC cannot register on a test without equipment for nanogram scale. Patients may accidently heat greens - which often leads to psychoactive medicine (possibly before reaching the milligram scale!). Some conditions may need to limit THC; just as many patients should only have a minimum of CBD (for any health concern, seek consult from clinician). On a dietary regimen, arrange a time for digestion. Remember, THC has a teeny biphasic window in nanogram doses. Responsibly, give 4 hours leeway from cooking with infused cannabis food and pulmonary medication. Hey, you still got yer topicals! In mammals, the liver processes dietary THC into 11OHTHC, an acidic cannabinoid active at GPR55 (like THCa, but very psychoactive). A healthy diet complete with lipids only builds excess lipid tissue when the calories sit, without exercise. In the same way, consuming the plant's cannabinoids begins a burden for a body when healthy fats and activity have gone unappreciated. Anandamide, naturally created for your endogenous receptors, gets switched back to a fatty acid (arachidonic acid) using the liver's enzymes. An optimal THC intake should protect your body from excess prostaglandins or loss of the liver's fat-storing enzymes. Dr. William Courtney, founder of the Cannabis International Foundation, explains how functions of the immune system are supported by Cannabis. Our Endogenous Cannabinoid System mediates the detection of Cancer Cells. These cells can then be removed by the immune system. The Immune System works non-toxically and targets cells unlike Chemotherapy and Radiation. “I believe this plant, having evolved over millions of years, is put together to support that system"
To look at a copy of one of Kristen's ICRS abstracts, hit the final paragraphs. "If you have not eaten cannabis for a long time, you are struggling alone: Your immune system is doing it's best - but, it's my belief that if the CBD was there 5 years ago, or 20 years ago - if it was part of your diet daily, there would be a lot less of those cancers that we then would have to struggle with, in a life and death fashion. You want to have CBD present before an event occurs. So, if you are eating leaf regularly, and if your CBD content is ready - think of it like Vitamin C: Its just an anti-oxidant on board. You limit the extent of the re-profusion injury, and you mitigate the damage from being done." Raw dietary use - the way animals use the plant: Provides trace THC, which activates ALL of the bodies CB1 receptors, matures the immune system's dendritic cells, neuroprotective & adaptogenic at COX-2, increases neural blood-flow, hepa-protective, reduces inflammatory prostaglandins, and proliferates healthy ERK signaling. Cannflavin forms to inhibit prostaglandins on new sprouts without 'detectable' cannabinoids. As a 12 day micro-green, acidic phyto-cannabinoid-rich hemp-grass carries multitudes of compounds good for circulation - a high acidic cannabinoid/total weight ratio of older sprouts activates GPR55 (anti-spasmodic, controls inflammation from bad cholesterol). Swish with blended hempgrass to restore oral tissue. Many terpenes (especially beta-carophyllene) active at CB2, mood stabilizing, promote neuro-genesis, and maintain stem-cell health. Careful titration with dietary or pulmonary to get about 125 micrograms per kg THC can boost brain activity (8.5 mg for 67 kg person). 'Corporate' use of the flower causes a reduction in blood-flow to the brain; dulls the immune system response to proliferating tissues; burdens the liver with estrogenic compounds. THCa slowly breaks down in the dry flower, while stored properly. These buds carry the physiologic dose; try kief and yogurt. Dr. William Courtney brings to light the major problem with the for profit model of the Medical Industry, and it's for-profit blinders. Cannabis is the botanical interface of our immune system.The western for profit model is that of destruction and attempt to rebuild. Cannabis fuels our immune system and allows us to heal according the laws of nature. When human blindness attempts to compromise this model, it often leads to failure or death. "It has captured these molecules that help our bodies regulatory systems be more effective. The bottom line is, its a dietary essential that helps all 210 cell types function more effectively. I don't even refer to it as medicine anymore, strictly as a dietary essential. Used as the dietary essential that it is, there is no need to call it a medicine." "And now we know that this GPR-55 receptor is part of the nuclear membrane, we know that it is found on the mitochondria; we know it is found on the endoplasmic reticulum, and on the lysosomes and endosomes. And that the acids are the molecules that act at that site." "From my perspective it is probably the single most important food substance on the planet after water." An interview titled "the Ultra-low Dose' with Dr. Bill discusses Dr. Yosef Sarne's studies on 100 micro-gram doses (of THC). When he'd found an important enzyme inhibiting COX-2 had changed to remain inside the cell for seven weeks (allowing new enzymes to establish in replacement; significantly reducing prostaglandin production), Yosef Sarne published amazing news for plant researchers. Yosef Sarne's first paper with the physiologic dose focuses on neuro-protection. After being impressed with those findings, he went on to the heart; then liver. The THC we collect in fat stores by eating a couple leaves builds up to the 100 microgram dose - where we have protection from ischemia; MDMA toxicity; seizures; inflammation; anesthesia; brain injury (continuing some weeks after a dose). 100 mcg THC approximates for 1/100 of a psycho-active dose; children with epileptic conditions can benefit from the biphasic activities without becoming intoxicated. In the animal kingdom, many face a 7 week period each year when no Cannabis grows, but the body has a store of THC to keep COX-2 enzymatically inhibited. To better understand how nanogram THC could inhibit COX-2 - herbs which share this activity (although not as long-lasting): Ginseng, Cistanche, Ashwaganda, Boswellia, Holy Basil, Magnolia Bark, and Lemon peel. Skullcap acts profoundly, also inhibiting COX-2 genetic expression. This herb has a root preparation called Huang Qin - strong in melatonin, helps Thalamus organize sensory input. Being one very active herb, skullcap preparations will impact the liver - no more than the alcohol in tincture. Possibly why raw cannabis promotes lucid dreams.. balance of the Hypothalamus - Pituitary - Adrenal axis; lower serum cortisol. Cannabis International Foundation has supported the whole plant for a decade; both in the clinic writing leaf juice prescriptions and standing up at conventions to speak on behalf of our vegetable - when often "THC" gets assumed for "Cannabis". "Cannabis is an incredibly complex, synergistic plant whose constituents have yet to be completely catalogued - yet alone understood. Until that time, which will not be any time soon, it is the individual who can best identify the specific plant phytogenetics / chemotype most suited to assist them in the preservation and restoration of their health. Once the ideal cannabinoid profile has been identified, then that ratio is tried in a number of plants i.e. Indica, Sativa, Ruderalis as a beginning point in assessing the contribution of various terpenoid profiles." Historically, raw dietary cannabis applications each held the intent to sharpen mental clarity, or aid organs of elimination. For many years, Kristen struggled with systemic lupus and pharmaceutical prescriptions. When her condition improved dramatically following several weeks of saturation with raw cannabis, they sat convinced they had discovered a cure for chronic illness. "You wouldn't consider a diabetic addicted to insulin. I have an Endogenous Cannabinoid Deficiency. When I drink the leaf, I feel more attentive, more awake. I can breathe better. I don't get heartburn or stomach pain, or feel muscle weakness or lower back or pelvic pain. By eating it, I am able to saturate much more so than I could. Even if I was smoking all day long, I wouldn't be able to saturate as heavily as I can juicing. I think the anti-fungal and anti-bacterial which is CBN, and the THCa and cannabidiol are all helpful. But I think, more importantly, it is the interplay of all the cannabinoids together that causes the most benefit. That when you isolate each one and take it alone, or take it as a pure synthetic it can't have the benefits - it doesn't have the same effects that they all have together. I thought: How does everyone not know about this. I felt right then and there my focus in life had to be helping other people in my same situation to get this information to use as well." Both Dr. Bill and Kristen share the joy of helping others with raw cannabis: "It makes you feel good when they come back, and they have stopped using something that causes GI tract bleeding or causes liver damage, pain pills and anti-inflammatory drugs. You feel like it's worth the whole struggle to get the education out there." NSAIDS like Aspirin increase endocannabinoids - with toxic side effects. Alternatively, THC raises anandamide; and CBD has the same methylating activity, to keep blood viscosity tolerable in a pulmonary disease condition. A 1:1 CBD:THC may have better psycho-activity than a low CBD chemotype. Moroccans, with dozens of uses for hash, likely have the best example of using 1:1 medicine. "Morocco may be the only place on the planet where men live longer than women. The cultural aspect is that men sit around and smoke this hash together that is 40-50% CBD. And so, by accident or societal prudence, they are consuming a significant quantity of these 'prophylaxis' cannabinoids, and it appears to have given them a capacity to weather the rough lifestyle and add years to their lives." 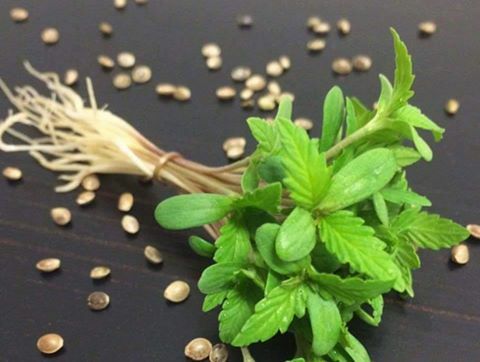 World-wide access to viable hemp seeds: Biona & Hempo brand seeds, available online. Search "Biona hemp", on amzn or US Ebay, and locate a vendor to ship to your residence. Hempo brand does ship to all lands; go to Hemping dot com; viable seeds in 200 gram and 1kg quantities. *My first order placed here 2012 they informed me 21$ shipped to usps up to few kilogram so I could order four bags or so. When buying viable, larger amounts with fast ship guarantees more viability (hemping usually 8 days). Maybe, mix these with sprouting seeds in zero-tolerance states. Although a great food source, 12 - 14 day old sprouts will not provide for your health as well as growing bonsai plants for leaf. Eating sprouted seeds has tremendous mood stabilizing activity; blended for a miracle healing mouthwash; some of the best compounds for elderly conditions and mothering. To germinate, soak in glass, ceramic or clay over a period of hours. Once you have the box prepared, layer the grain and spread the cover of moist media above; keep this soil slightly watered at all times - a spray to rinse away mold. Soil, sand, amended mediums with peat or coconut, hemp woven mats/unwoven fibers could each suit hempgrass! I found 'Dry Desert Cactus Potting Mix' from and organic gardening brand, which seems to have the primo mix. Typically, a pinch of seeds has about 80 count. Sprouts like light, especially white and blue spectrum. Deeper reds also raise CB total; this creates a very noticeable sensation of the trichomes on your tongue, when eaten (beginning day 7). One pound of viable seeds will yield 3 pounds of sprouts. Remove and clean uneaten grass from medium to refrigerate after two weeks. Prescriptions for a condition will differ, with each personal health being different. If you need consult, Kristen, or David Mapes will have access to experience with many patients in clinical cannabinoid therapy. I can help with locally available, home-made medicine. A Colorado caregiver and cancer survivor may create a raw or active tincture for the clinically ill within the United States. He found high-quality medical flowers and a good technique. If you live near medical or recreational gardens, ask for organic leaves. Gardeners remove pounds of fan leaf per month. Before composting or after a wash for collecting hash - but only organic! Sanahemp juice, Kama Hemp, Cannamin and Grow Hemp Colorado with local hemp juice - Netherlands, Ireland, Cali and Colorado. Some may ship; for US Cannasqueezed has your safest option for shipping juice. Of the best raw cannabis products you could take: 26% CBG acid, 64% THCa, 10% CBD-A oil from www.nonameoil.com - Lyme's; viral disease; PTSD. . child safe, high cancer rate therapy, prophylaxis for aging. SHIPS GLOBAL. From the site: "seizures; arthritis; Chron's; fibromyalgia; autism; epilepsy; psoriasis; Parkinson's; anxiety; chronic pain; inflammation. It has now shown to kill cancer cells, tumors; and works to keep cancer from starting." 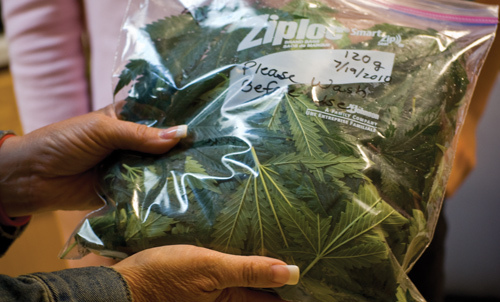 A special plant strain is putting renewed life energy and healing in minutes. With many types of chronic pain, and ailments, No Name Oil helps bring the feeling of normal, with a reduction in pain and anxiety within minutes . Rub it where pain is, and/or give orally. Place 2-3 drops under your tongue for 60 seconds and swallow. Use twice a day, morning and before bed. No Name body tune up oil is a clear amber oil, with a sweet taste like honey. All natural oil. No imitation flavorings. Not precooked oil Cold Press to maintain individual nutrients. I recommend his 12 droppers @ $190 over any caregiver expense! 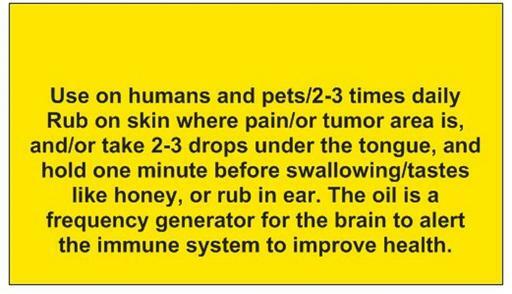 The oil will become psychoactive with heat; directions for partial activation in PDF guide link from Epsilon (top). This lovely site carries an assortment of hemp flower products to anywhere worldwide! I've collected these hemp pellets a few times, and fondly read a lab report of organic slovenjian hemp..nice as tea, this flower product for medicinal use holds a broad variety of wonderful compounds! https://www.hsicbd.com/online-store carries 'Nobacco' flower (in both CBGa and CBDa varieties); available to EU. Using hemp flower and oils to craft topicals, include cold pressed oils (or Emu oil) and essential oils (or careful 1/100 pts DMSO). Dispensaries supporting juicing: Arcata Humboldt Patient Resource Center, the San Jose Canna Culture Collective, the Mendocino Leonard Moore Co-op, the Kalamazoo Med Joint Community Compassion Center, and the Olympia Sonshine Organics Network. Sproutable raw viable pure CBD Hemp seeds, available from Suma, Detox Your World, The Happy Health Company, Biona, Hempiness, Haiths, and Hempo. For those who can grow cannabis, plant a seed or clone each day; the bonsai technique allows you to have vegetative leaf and a flower each day. Place under 12/12 lighting, with darkness to allow the seedling to flower. 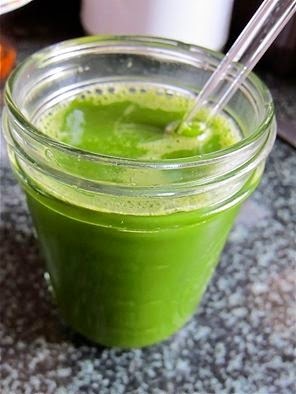 Roughly 30 leaves, or 6 grams of leafy greens create a good blender smoothie. Whether blender smoothie or fiber-less juice, the freezer works best to store cannabis juice for tomorrow - keep in mind the containers made of plastics and glass left holding a liquid cannabinoid solution will compromise the potency. Leaf, eaten in the vegetative stage, has more trichomes - clear or milky. Eating one single, whole, leaflet may give less shock to a bush, compared to each time you remove a fan whole. Pinch one leaflet away from a developed vegetative leaf; up to 30% of a healthy bush can go to juice before flowering. Eating a fresh bud means more chewing for the patient, but the only way to deliver 100% of the medicine - recommended for any advanced condition. 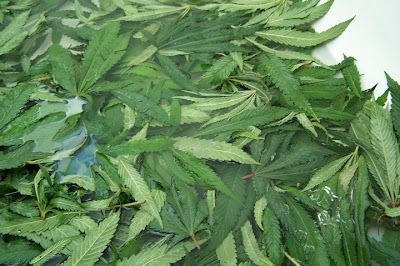 To prepare leaves for a juicer, soak in a bowl of cold water for 5 minutes (adds moisture to the hemp, for more juice). 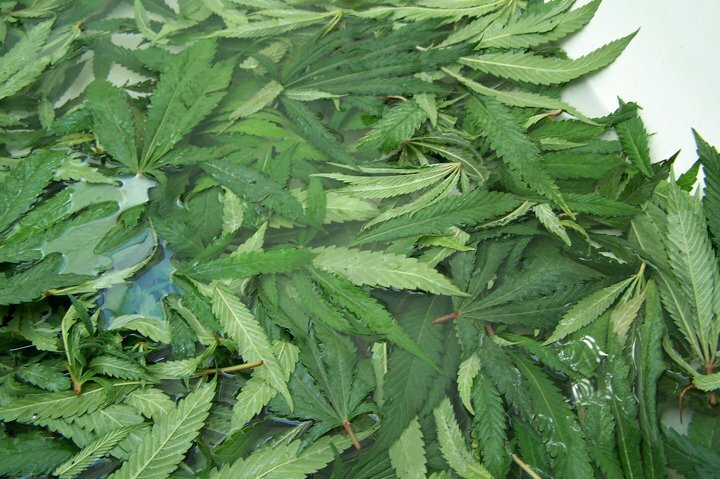 Make sure not to rinse the leaf - this will wash off trichomes! Make sure the leaves get shaken/picked clean before the soak - even organically grown. Coconut oil & water, in use, will lubricate leaf through masticating herb juicers. Kristen and William started juice with mixes of carrot juices 10:1 with leaf. Today, Kristen may use any blend of "Whatever is around"; mangoes, lemon juice, turmeric, ginger, kale, broccoli, beets. "It's the poster-child for raw food." "You can use it in the morning and midday, still function - drive cars, there is no interference with your ability to take care of your daily issues." Do not risk eating plants sprayed with any pesticides. When it comes to spider mites, "Protein". 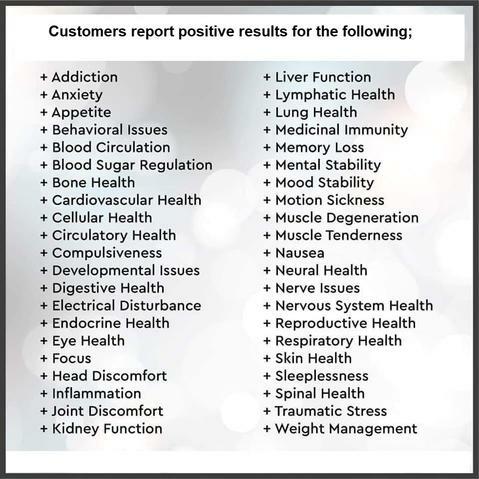 This complaint published on a health e-zine does not pose a health risk: "The throat irritation is based on the fact that the stems of cannabis have sharp little hairs" from Why the raw cannabis juicing trend may not be all it's juiced up to be -Xeni Jardin. In a narrative of Superfoods: The Food and Medicine of the Future, David Wolfe said "Hemp leaves contain a high percentage of silica and fiber. One side of the leaf is soft and the other side is abrasive; the leaf is eaten and the fiber moves through the body, the sides of the leaf churn through the tract, scrubbing and softly cleaning the intestines." 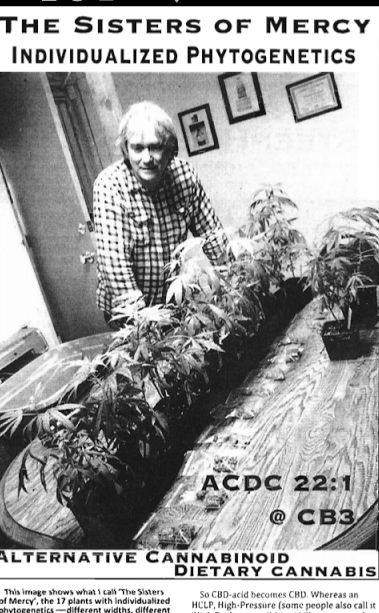 "If you heat the plant, you will de-carboxylate THC-acid and you will get high. You'll get your 10 mg (of THC). If you don't heat it, you can go up to five or six hundred milligrams, use it as a dietary cannabis and push it up to the anti-oxidant and neuro-protective levels which come into play at hundreds of milligrams. . . . It is this dramatic increase in dose from 10 mg of psychoactive THC to the 500 mg - 1,000 mg of non-psychoactive THCA, CBDA, and CBGA that comprises the primary difference between traditional ‘Medical Marijuana’ and Acidic Cannabinoid Dietary Cannabis." "However, other compounds in the plant, such as terpenes, may have an effect on mood or energy levels." About one in 1,000 of Courtneys' patients had a psychoactive smoothie, in recipes with both the leaf and the flower. This combination may make the smoothie much less effective as an anti-inflammatory for the patient. Allow your electric juicer to cool when running lots of leaf: A hot cannabis soup could potentially equal the THC in tens of joints. A hot grow lamp, or extra heat from the sun on bud may also mean more THC in your raw cannabis. A medicinal terpene application, sniff a whiff of ground buds before vaporizing. Patients found the juice lowered their blood pressure an average of 10 points within 2 hours. Patients with arthritis have used fresh leaf as a topical anti-inflammatory; placing ground leaves over the affected ligament overnight. "The body produces endogenous cannabinoids. You may have heard of endorphins: that's endogenous morphine. Well, in a similar fashion, the body produces endogenous cannabinoid." "A million times a day, cells begin to divide that shouldn't be dividing; and the immune system has to say, 'Hey, you know, the shrubs are getting a little hairy there - we've got to trim them down. We've got enough renal cells or kidney cells. We've got enough bone cells, muscle cells'. So the immune system's highly competent at dealing with that - but it can become more competent. That is exactly what cannabinoids do, whether you're talking about the body's endogenous cannabinoids, or the plant, which can be phyto-cannabinoids or exogenous cannabinoids. Both of those terms (phyto-cannabinoids and exogenous cannabinoids) refer to those twenty carbon molecules produced outside of the body, but bind to the protein receptors on the cells in our body and therefore, help regulate it. So, whether we're talking about the body's chemistry or the plant chemistry, their role is to modulate the function of the immune system." "So, a cannabinoid is a modulator that restores optimal function! The plant facilitates the rapid restoration of the normal function." Kief the bud, then add it to yogurt. Dried trim Leaf: Baked goods or Shona Banda oil (higher in THC use in edibles). Topical: Use oil to extract the cannabinoids (THC, CBD, CBC, CBG, CBN). Fill bottle with bud and or leaf then cover with oil and shake for 2-3 weeks. Filter off the plant material. Use as a topical massage oil for local pain, muscle spasms/articular inflammation. Alternatively, add 1 gm kief to 2 ounces of melted salve and dissolve. Apply locally, increasing test dose strength gradually. Tincture: Use edible alcohol, cover the bud/leaves with alcohol, can crush/stir the mixture only done for minutes you will primarily get cannabinoids. If done longer, you will increase the amount of chlorophyll. Other topical uses: Leaf powder can substitute for sugar/salt or apricot seed as an exfoliating skin rub. Hempseed oil has SPF 6; and softens skin/hair. "If there is a word I would choose for my tombstone that would summarize the last six or seven years, if not the rest if my life, it's the clear vision that cannabis as a plant, with all of its incredible synergy is a homeostatin for animals. You have two parts of the carbon cycle: you've got the plants that take in CO2 and produce sugars and food and exhale O2: so you have the plant and animal as two parts of this integrated carbon cycle as complementary aspects. What is that relationship about? Why would a plant produce 120 carbon molecules that primarily regulate the intra-cellular environment of the animal? The animal takes that oxygen and mixes it and produces CO2. They go back and forth and why would a plant spend such an incredible amount of energy to produce these molecules that supports the physiology of the cell? And now we know that this GPR-55 receptor is part of the nuclear membrane, we know that it is found on the mitochondria; we know it is found on the endoplasmic reticulum, and on the lysosomes and endosomes. And that the Acids are the molecules that act at that site. When we take the plant - the cannabis - and heat it, then you lose that interface. The homeostatin is a molecule that supports homeostasis and the restoration of optimal function: it takes the over-active cell and down-regulates, the underactive it up-regulates. The homeostatin is the molecule that mediates homeostasis and its complement in the world genome. And so there is this very very deep relationship between the plant and the animal. And l believe its primary role is the optimal function of life on the opposite side of the pole. . . an interface as beautiful as a relationship can be." When 5 mg/kg of CBD becomes your rx, you may need to remove THC to allow a higher quantity to be tolerated; unless a pure CBD strain becomes available. "Take your cannabis. 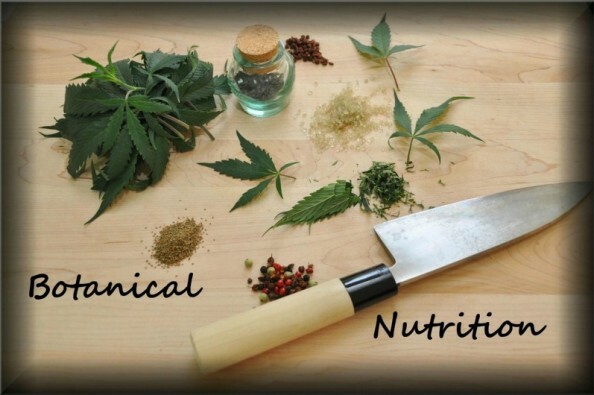 You grind the cannabis to a fine degree which increases the surface area so that you can get to the cannabinoids in the plant material. You get a variable temperature heat gun, which allows you to provide a constant single temperature for hours at a time, so that it's better than any of the vaporizers, because it's very, very, very steady. You turn the heat on until it goes to 166 degrees Centigrade. The longer you heat it the more THC is boiled." D9THC boils at 157C. D8THC boils at 175C. CBD boils at 160-188C. CBD Diary – Project CBD informs, "However, both begin to sublimate off at even lower temperatures, and commercially available vaporizers, even the Volcano, do not heat evenly enough to allow fractionation of one component over another. What your patient is doing is wasting some cannabinoids and terpenoids by preheating. To get all of them out requires more prolonged heating, or a higher temperature. When the latter is done, it favors higher molecular weight sesquiterpenoids, many of which are sedating." In one study, an electric vaporizer test found substantial amounts of THC while producing no benzene, toluene, and naphthalene (toxins generated with combustion). CBD may test at 4,500mg/lb in Northern Lights (a 1% CBD). A new strain may have 22,000 mg/lb! For a 200kg person to reach a 5mg CBD dose requires 500mg of a 5% strain. CBD tests found it may have lipid anti-oxidant properties stronger than Vitamin E - useful in the prevention and treatment of oxidative conditions; such as amphetamine or alcohol exposure, and diseases of the CNS (as it crosses the Blood-Brain-Barrier and exerts anti-oxidant activity). Furthermore, sedative; hypnotic; anti-epileptic and anti-dystonic activities.!. William L. Courtney elaborates, "So, it's a fat molecule that can get into the brain - which is very hard to do because the brain is very protective; but because this has 34 million years of research on its side, it knows how to walk between the lines, and the body has allowed it access to the brain. So, for Parkinsons, for Alzheimers, for strokes whether embolic, hemmorhagic, or traumatic, or surgical, these are all conditions where CBD is uniquely beneficial." CBDa has appeared on tests of: Industrial Hemp; strains bred a few decades ago which remain as the 60's-70's had them; plants from sohum seeds, cbdcrew, centennial seeds, and labs such as GW Pharm. CBNa (cannabinolic acid) may begin in the plant naturally, at maturity - as THCa ages we may get THCa > CBNa. Some activities CBN has shown: sedative; anti-leshmanial; antibiotic; antibacterial; antifungal; anti-convulsive; anti-proliferative; able to decrease intestinal motility; while CBNa has regenerative activity at the stem cell. Shona Banda Oil, cured in a sun-lit container, may concentrate CBN. Resin (or reclaim oil) carries less THC than smoke, and possibly 0.3% more total CBN and CBD. Bong-water has no cannabinoid content without an addition of alcohol or fats(Marijuana Chemistry, Michael Starks). CBN may pass through the scalp; worthwhile use for it! Growers in Northern California, working with the clinic have found that hermaphrodite seeds express unique cannabinoid ratios, from each of various genes chosen in her gamble to survive the species. The Sisters of Mercy, 17 different female seeds from a hermaphrodite (self-pollinated intersex), an inter-sexed Cannatonic mother. Each range between low THCA /high CBDA, a plenum varieties applying to needs for each individual's condition. "There is tremendous drive within this plant to survive the winter. Stressors like light, heat, hydration, chemicals; anything that really pushes the plant will force it to make it's last ditch best effort to survive. Then, suddenly, feminization was not just a horrible human intervention; it was this plant stating "Wow! This is a rough environment and we need to put our best foot forward.!" And in doing so, it may throw it's wildest cards down on the table. So, despite all the huge negatives of hermaphroditic changes, the fear "All feminized seeds are going to select for hermaphroditic and we must steer clear of them! " the hermaphroditic tendency is a survival tendency. "Use of the raw plant includes the acid cannabinoids; CBDA, THCA, CBGA, CBCA. The acid cannabinoids, CBDA and CBGA are now known to act at GPR55 as potent antagonists of that pro-inflammatory receptor. The acid cannabinoids are 2-4 fold more effective than the neutral cannabinoids, which have been the exclusive focus of study for the last 30 years. The neutral cannabinoids (CBD, THC, CBG, CBC) are functionally synthetic molecules made by application of heat to alter the naturally occurring Acidic Phytocannabinoids. The specific ratio of cannabinoids is an area of tremendous significance and an area in need of additional research. Consumption of the whole raw flower / bud and leaf is the best current thought. If analysis is not available, assume high THC concentration in the 8% to 21% weight to weight or w/w. In general CBD is usually less than 1% w/w. Another way of describing the relative amounts of THC to CBD is cannabinoid content. For the vast majority of strains in California the ratio OF CBD TO THC per 100 grams of cannabinoid, is 0.4 to 1.0 grams of CBD/100gm to 90-95 grams of THC/100gm. Sadly the other 78 cannabinoids share the remaining 4 grams. Note that W/W is the amount of CBD per unit weight of cannabis where cannabinoid content is an estimate of the relative amount of THC, CBD, CBC, CBG, CBN etc per 100 gm of cannabinoid extracted from a particular strain. Individuals often start out with 1-3 grams of bud / flower to assure no idiosyncratic allergic reaction or psycho-activity. In indoor grow rooms with low ceilings sometimes the buds get very close or touch the high pressure sodium lights which are hot enough to breakdown THCA into THC. It has been suggested that very hot outdoor grows may also have some decarboxylation at the top of the plant but this is very rare. Once comfortable with raw flower, slowly increase the amount to 14 grams or 1/2 ounce wet weight bud harvested from the living plant. In addition to the raw bud use 30 to 300 leaves per day in accordance to the amount of plant that can be consistently provided on a daily basis. It is best to juice the leaves to decrease bulk of the fiber but it is best to blend the flower into the juice of the leaf, particularly with the new 10-20% CBDA strains. 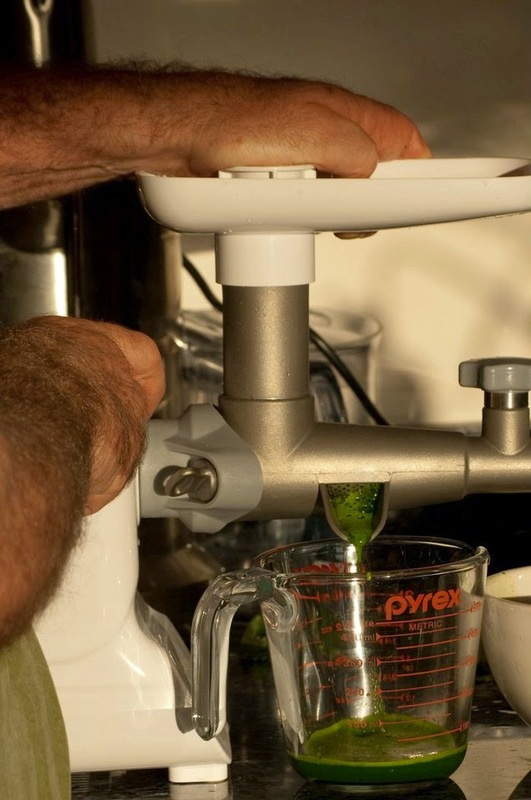 Blending the bud rather than juicing it, reduces the loss of cannabinoids that adhere to the ejected fiber that is part of the juicing process. In the past bud was juiced when using 1% CBDA plants because of the large amount of plant material required in order to recover 600 mg of CBD. Flavor management is a very important for compliance. The juiced leaf and blended flower is combined with hemp milk/ hemp oil / keifer / yogurt into a smoothie or combined with fresh vegetable or fruit juices. Organic produce without the fungicides, herbicides and pesticides are important if available. The smoothie / juice with its phyto-cannabinoids / terpenes / flavinoids are best taken in divided doses due to their rapid clearance i.e. the cannabinoids clear in about 50 minutes after absorption from the intestine is complete. If the final amount is 10 ounces, then divide into five 2-ounce doses and take every 4 hours. Keep on ice. Shake before using to mix the fatty acids with the water portion of the juice. For serious illnesses, try for 6 doses a day, that is leave one dose in the refrigerator for consumption if one gets up to use the restroom at night. Replace high THC plants with plants of increased CBD content and ideally with plants providing specific ratios of CBDA to THCA indicated for the specific medical condition. The THC dose, for those that are comfortable with THC, is 10-15 mg. If you are blending a bud into a glass of juice it could and should have 5-600 mg of THCA and 5-600 mg of CBDA if the plant is a 1:1 plant such as the original Cannatonic 6.9%w/w CBD to 6.2% w/w THC or a tested strain of Harlequin, which range from 4%/4% to 8%/8% CBD/THC. 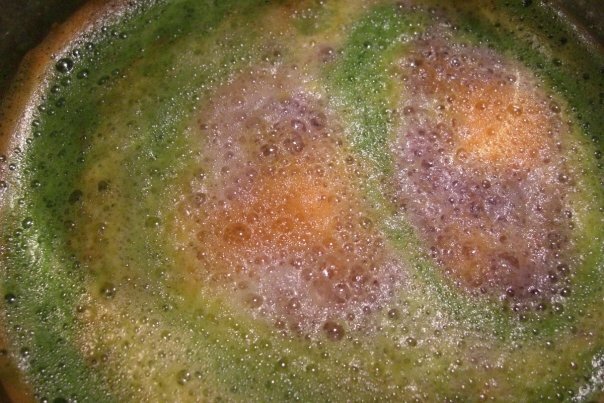 If that juice is accidentally heated by placing the ‘vegetable’ juice into a vegetable soup, it will create a very psycho-toxic dose of THC. Reiterating to a fault, if you are consuming 600 mg of a 1:1 plant, you are consuming not only 600 mg of CBDA but also 600mg of THCA, upon heating the THCA turns in to approximately 580mg of THC when the tolerable dose is 10 mg! That would be like consuming 58 brownies when you can only tolerate 1! If you find a source of Cannatonic seeds beware that the Cannatonic feminized seeds can vary widely from the original plant. Recent HPLC testing showed an expression of CBDA from 22% w/w to <1%CBDA and concurrently THCA contents ranged from 1% w/w to 30 % w/w. This marked divergence mandates testing of the plant while keeping back living clones in case you locate the desired cannabinoid ratio." "The fact that such a prestigious institution as the National Cancer Institute has acknowledged that there are direct anti-tumor effects, means that at the top things are beginning to change. But that will have a double-edged sword: If cannabis really is that beneficial, let's get out there and make it Roundup Ready, and grow it cheaper ,and make sure it's sterile seeds.. so you have to buy it from Monsanto. So people can't propagate it on their own. It's the next wave: If it's not basically illegal the world over, then let's make it inaccessible - unless you buy from a company that owns it's genetics." "Over 525 different chemical compounds have been identified in the Cannabis plant. These substances act as primarily feedback modulators facilitating the Endogenous Cannabinoid System’s regulation of cellular physiology. The plant’s primary constituent is THC-a, which along with other phyto-cannabinoids, interact to modulate the immune system. Patients become dysphoric or euphoric on 10-20 mg of THC, well before they can take in a full dose (200 to 1,000 mg) of the other non-psychoactive cannabinoids. Many middle-aged patients cannot tolerate THC, even if it alleviates their symptoms, due to the dysphoria that interferes with their day-to-day functions. Age or heat decarboxylate THCa to THC, reducing the tolerable dose from 2000 mg to 10 mg, and resulting in the loss of the inflammatory, anti-spasmodic and anti-proliferative activities of the cannabinoids. US Patent 6,630,507 states that certain cannabinoids can have useful therapeutic effects, which are not mediated by cannabinoid receptors, and are therefore not accompanied by psychoactive side effects. Furthermore, the absence of psycho-activity in some cannabinoids allows for very high doses to be used without encountering unpleasant side effects or potentially dangerous complications. In October 2009, we confirmed that the 14,500 µgm / ml of non-psychoactive THCa was potently active in modulating the immune system and was tolerated because the 90 µgm / ml of free THC does not cross the CB1 stimulation threshold. This has supported widespread interest in juicing the whole plant, diluting that juice 10:1 for palatability and then consuming the juice in divided doses up to 5 times / day. We have discovered that dietary leaf therapy is a gradual process that increases over the first two months or regular use. Once the plant is absorbed, cannabinoids clear in 50 minutes supporting a q3-4 hour dosing." "Every body needs access to this plant; but people with nothing else, at least this would give them their health back. Relax them, and help them enter a state of mind where they are more creative, more open to the changes they're facing; less fearful about what that means. And maybe, even offer them a sense of peace and hopefulness about what is next. Rather than focusing on what you have lost. For places that don't have adequate vaccine, that are impoverished, this is a cheap way they can protect their bodies - and also one of the best ways they can do both at the same time. Cannabis is one of the major plants used throughout time, it is so often overlooked, when people talk about medicinal plants of the past, people don't realize how important of a role it has played, and that compared to the whole of Human existence, it is only very recently that has had a negative stigma attached, or that is has been illegal... - compared to the whole of Human existence. I think William is right: that we should all be writing Obama a letter thanking him for the government patent on Cannabidiol... and urging him to allow us Medical Freedom." Hempo brand, shipped to any state or country, from hemping dot com, under Food.